Pebble Beach California isn’t just about blue waters, beautiful beaches and green landscapes. Every summer, it turns into a gathering ground for magnificent classic cars! And incidentally, into the ideal location for the exclusive Vision Mercedes-Maybach 6, to emerge! A sensational luxury-class coupé, the two-two seater is where vintage definitely meets the future, with the coupé reinterpreting classic, emotional design principles in an extreme way, following the Mercedes design philosophy of sensual purity. 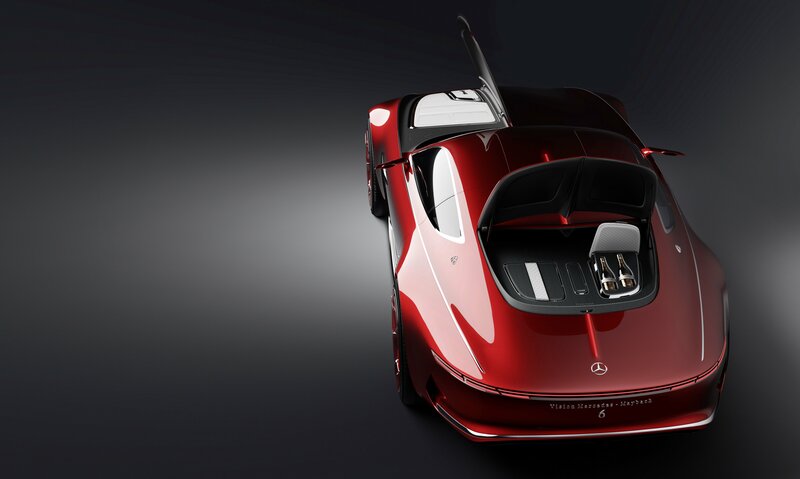 The Vision Mercedes-Maybach 6 measures almost 6m in length and is designed as an electric car. The drive system has an output of 550 kW (750 hp). The shallow underfloor battery allows a range of over 500 kilometres according to the NEDC (over 200 miles according to EPA). Its unexpectedly new design is described as emotional, with both “hot” and “cool” details, and an overall reduced aspect exemplified by the aerodynamically intelligent basic shape. The airflow hugs the contours of the vehicle and breaks away only at its tail end. The narrow lights, the partially transparent rims and the split rear window distinguish themselves in a surprisingly technoid character. Its extremely long bonnet, the low roof line and the rearward positioning of the greenhouse recall the aero coupés of days gone by. 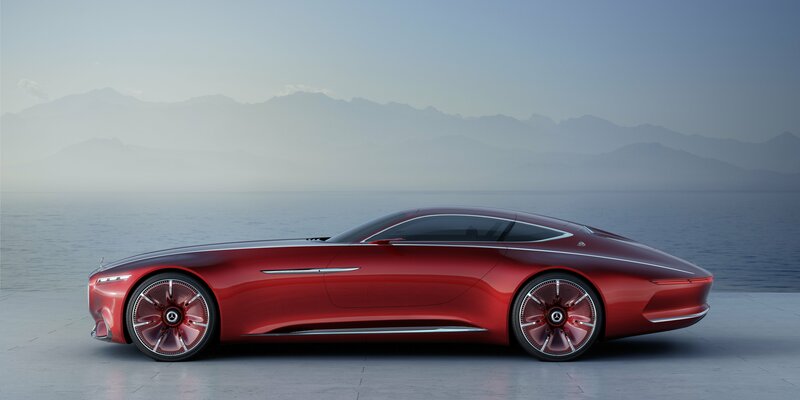 According to Gorden Wagener, Head of Design at Daimler AG, the Coupé, the Vision Mercedes-Maybach 6 embodies “the ultimate in contemporary luxury… with its intelligent appeal and reduced, technoid look.” Indeed, the aesthetic of the car show exactly that. Its clearly defined contours and organically formed wings stand in contrast to the sharply drawn, extended feature line on each side which defines the upper vehicle body from the radiator grille across the entire length of the vehicle to the rear. There is also a striking contrast between the Maybach red paintwork and the chrome strips which sit above the wheel arches and in the centre of the bonnet and boot lid. The concept car aims to embody the ultimate in green luxury, with emission-free driving through the electric drive system generating 550 kW (750 hp). The side sills, illuminated by LED light strips, clearly underline the fact that the Vision Mercedes-Maybach 6 is designed as an electric car. Thanks to its four compact permanent magnet synchronous electric motors, it features all-wheel drive. The shallow underfloor battery has a usable capacity of approx. 80 kWh and can either be charged via a cable connection at a public charging station or a conventional domestic outlet or, for even more convenience, it can be charged wirelessly, via an electromagnetic field.